Food waste can occur at any point along the supply chain: from produce left to rot in the field, from expired food discarded by the retailer, to leftovers scraped from dinner plates into the garbage bin. Anywhere from 25% to 40% of the food that is grown, processed, and transported in our country will never be consumed. Instead, it will end up in the landfill, where, according to the EPA, it produces methane that is 21 times more potent than CO2 as a greenhouse gas. Act 148, also known as "Vermont's Universal Recycling Law" makes significant progress toward redirecting food scraps from the landfill to compost that enriches the soil, or to farm animals. But focusing solely on food scraps misses the big picture: Perfectly edible food that could be used to feed our friends, neighbors, and ourselves, is discarded every day. The Northeast Kingdom Food Cycle Coalition is working to reduce the loss of edible food by redirecting it to those who need it. 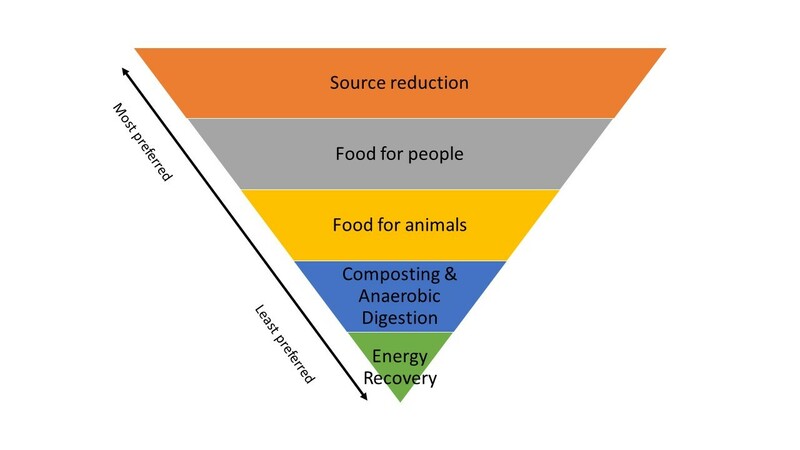 We follow Vermont's hierarchy for food wastes, as shown on the diagram above. The group meets monthly, normally the second Tuesday of every month at 10:00 in NVDA's conference room in St. Johnsbury. All are welcome. For more information, contact Alison Low at NVDA. The Vt. Department of Environmental Conservation maintains a Food Donation webpage that has additional useful links. The Bill Emerson Good Samaritan Act: Companies and organizations who donate healthy, edible food that would otherwise go to waste, are protected from civil and criminal liability under this act. This is the full text of the law.